Humankind's love of hamburgers began when we were not humans at all, but a 5-foot-tall pseudo-human called Australopithicus, who, quite by accident, discovered the wonderfulness of cooked meat when either lightning or a spark from the friction of stone tools ignited dry grass and seared freshly killed bison. 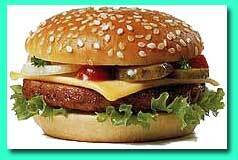 Fast forward the picture a couple of million years to the Russian tundra, where the first recorded "burger history" shows that nomadic horseman laid the groundwork for the modern-day hamburger. Then, Mongolian and Tartar warriors, who loved the taste of raw steaks, softened their filets by placing them under the saddles of their horses while riding into battle or on marauding parties. Later, when it was time to eat, the filet would be eaten raw, having been tenderized by the saddle and the back of the horse. Supposedly, this is the origins of the delicacy steak tartare, the raw first step to hamburger. Fast forward the picture again a couple of hundred years and stop on New York's Ellis Island, where immigrants from Germany were entering the United States in the early 19th century with a recipe for "Hamburg Style Steak," a chopped and broiled filet that was served raw in Hamburg.